The rise of wearable technology began in 1975 when the first calculator watch was launched by Pulsar. Over time wearable technology started to improve. In 2008, Fitbit takes wearable technology to the next level. The company’s CEO James Park has the vision to combine the health conscious trend and technological savvy nature of the millennials together. The result was a big hit and the company went IPO only 7 years after the launch raising $358 million. Fitbit was able to capture value by providing the customer with the data that they have never seen before. Performance tracking for serious athletes has been around for a very long time. However, for the general population, there is no way to track their performances. At the peak, in July 2015, the company has a market cap of nearly $10 billion. During that time Fitbit owns ~35% of the entire wearable technology market share. Unfortunately, the dream does not last very long. As of today, Fitbit stock price is $5.15. The market cap is sitting at a little over $1 billion. The company value drops by almost 90% in two and a half year. So how did the company that did so well became a loser? Despite a very strong start, Fitbit doesn’t have a sustainable competitive advantage. While the idea of using technology to track daily exercise is great, the idea itself was not patentable. Fitbit can only patent its tracking technology. However, it doesn’t take very long until competitors come in and compete. Fitbit faced direct competition from players such as Jawbone, Xiaomi, and Apple. Jawbone entered the market in 2011. The company competes with Fitbit using a similar technology and a more fashionable design. However, the real threat comes in 2014 with the entrance of Xiaomi. The Chinese giant leverage low-cost strategy and conger ~17% of the market share only one year after the launch. Apple also launches the Apple watch in 2015 and immediately steal ~15% of the market share. The market got so competitive that Jawbone went out of business in 2017. Apple not only competes with Fitbit directly through Apple Watch. The iPhone, as well as other smartphones, are also indirect competitors of Fitbit. All new smartphone models have a tracking capability that allows users to track their exercise. While this function may not be precise it is good enough for many users and further dilute the market share of tracking device focused player such as Fitbit. Fitbit is now in a very challenging position. Xiaomi overtook the company wearable market leader position in 2017. 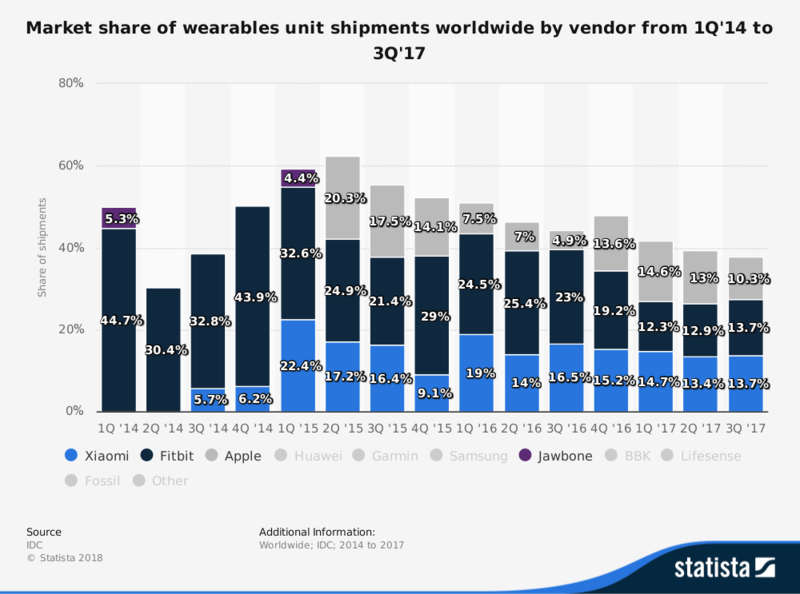 Apple and Samsung are also very active in both smartwatch and smartphone market stealing market share from Fitbit both directly and indirectly. At the same time, the vitality and the community effect that Fitbit had built is declining. So, is there hope for Fitbit? The answer is maybe. Fitbit did make some interesting acquisitions over the year. Switch2Health is a startup that develops social wellness health platform. FitStar, another health-related startup focuses on streamlining people workout. Pebble and Vector Watch are startups focusing on wearable technology. It’s up to Fitbit to leverage these startups to gain back market share. Hi Pumchanut, thanks for writing this fascinating piece on Fitbit. It made me think of Under Armor – also a fitness and sport brand – that started by selling clothing with a some comfort advantage, but essentially no other competitive advantage, and that too in a saturated market. But it did really well simply based on the brand it created. And yet Fitbit not only created a new market, but competitors also had to cross a higher technical hurdle to compete with them. And yet it seems that they did not create a strong enough brand message around its differentiation points, which is why the likes of Apple were able to strong-arm them. This makes me reevaluate the role of marketing and brand management even for technologically superior products that are first-movers. If you don’t have a strong enough brand (like Apple), your product should be very cheap (like Xiaomi). Especially for daily-use tech products, it seems like consumers prefer either (perceived) luxury or commodity, rarely an in-between. Great post! Fitbit’s rise and decline also reminds me of Garmin, the GPS company that began with GPS’s for the car, which got disrupted by Google Maps on mobile devices. They then shifted into wearables with GPS enabled (for runners etc) and have also expanded into other verticals such as marine navigation (with an acquisition Oct 2017) and aviation where GPS is still critically important. From a low in 2016 ($32), Garmin’s stock has been able to rebound ~2x ($62) as they’ve refocused on their core competency (GPS) and looked outside of consumer products. I’m wondering if Fitbit can do the same – their heart rate and health technology may be valuable for hospitals, health insurance companies, and/or healthcare clinics. I can completely relate to this post as a previous Fitbit owner who has stashed it away in a drawer somewhere. I think you’re right in that what drew a lot of people (including myself) to them at first was the fact that it was any bit of data that I could have to quantify how active I was without entering it manually myself. It was before iPhones had the health app that shows your steps and before Apple had the watch. So compared to non-consumption, this was a great option and you could get one for as low as $60 or around there so the barrier to buying one was fairly low. Now that there are products that track much much more and people carry their iPhones everywhere anyway that tracks steps, the Fitbit has become essentially useless. It will be interesting to see where the wearables market goes from here. There are many startups trying to get into the space selling products that track one-off thing such as hydration level, sleep needs, or how high you jumped but it will be interesting to see if there is some aggregation that becomes a one stop shop for all metrics or if that is virtually impossible given the technology that is required of each. Great post! I’m curious about the growth of the overall wearables market itself. As purely anecdotal evidence, I recall being very bullish about the possibility of fitness tracking ~5 years ago, especially with the launch of such apps as Apple’s Health app. However, I recall that general excitement for wearables as a fitness tracker diminished considerably as 1) accuracy of data was called into question and 2) consumers like myself couldn’t really meaningfully use the data once it was collected. I’m not familiar with the Xiaomi device, but I would assume that its dominance is largely derived from market penetration in China, and thus I wonder whether Fitbit’s decline is due to wearables fatigue in the US market? Thanks for sharing Pum! And lot’s of good comments on this topic. I can’t say I’ve ever owned a Fitbit, but as everyone alluded to, I wonder what the company’s true value proposition was? Furthermore, could Fitbit have done anything differently to prevent itself from becoming a “loser.” Could Fitbit have expanded into healthcare wearables or monetized the data it collected or provided better insights or created a community? Or was it doomed from the beginning because of products like the Apple watch? So many questions, but very few definitive answers. Thanks Pumchanut for sharing, I can see a similar pattern with Go-pro and similar trends that was taken over by mobile phone or bigger competitors, I was surprised that they are competing head to head with Apple and Xiaomi, and I think theirs strategy to expand their business to health solutions and recent acquisitions may maintain that competitive advantage for awhile. I wonder if they could partner with major manufacturers, health insurance companies or fitness clubs, to provide their services on a broader range and not just wearable products. Fun fact—Fitbit launched a new watch today (the Versa) that looks exactly like the Apple Watch. It only took them three full years to come out with the copy. At this point, I wonder when shareholders might start pushing management to return the remaining cash on the balance sheet and run the business for cash into the twilight. As a Fitbit owner, I really want them to succeed. But I am short their stock. I purchased their Ionic device which is perfect for my needs. However, I think I am a very niche customer. I love that it doesn’t have too much technology, but can still play music wirelessly. But I don’t think this is a very large market. And as you mentioned, their advantage right now is not very defensible from competitors. I think if they can transition to a more health-focused company, they will have a much better chance of success.